Many experts believe that’s because U.S. leaders want to maintain public support for other ground-level missions in the region that are harder to sell to the American people, politically. But so far, no one has stood at the Pentagon podium and directly said that balancing regional threats like Iran and “Shia influence” is part of the current policy or strategy. “Never give up a sales pitch that’s working,” said Barry Posen, director of the Security Studies Program at the Massachusetts Institute of Technology. “The great thing about the [ISIS] mission is it was already sold to the American people," Posen said. Officially, the only mission for U.S. troops on the ground in the region ― including about 5,000 U.S. troops in Iraq and 2,200 in Syria ― is to defeat and destroy ISIS. But recently the White House has begun to reveal a massive new mission on the horizon for U.S. troops in the Middle East: containing Iran. National security adviser John Bolton on Monday said countering Iran’s influence in Syria and elsewhere is a major goal of the U.S. military mission in the Middle East. “We’re not going to leave as long as Iranian troops are outside Iranian borders, and that includes Iranian proxies and militias,” Bolton said, signaling a fundamental shift from the current counter-terrorism operations to a mission focused more on geopolitical maneuvering and proxy warfare. Bolton’s comments echo sentiments that are widely shared among the think tank experts and hawkish defense officials in Washington who allude to the real purpose of U.S. forces as balancing against regional threats like Iran. “I would prefer to keep U.S. troops there indefinitely, because they also serve a purpose in blocking Iran’s freedom of movement and access to lines of communication that would connect western Iraq with Lebanon,” said James Phillips, senior research fellow for Middle Eastern affairs at the Heritage Foundation. The forward operating base at Al Tanf, manned by dozens of U.S. troops, but far from the concentration of ISIS, is one example of a larger strategic mission cloaked in the mantle of counter-ISIS operations. Al Tanf is located at the strategic border area between Iraq, Syria and Jordan. 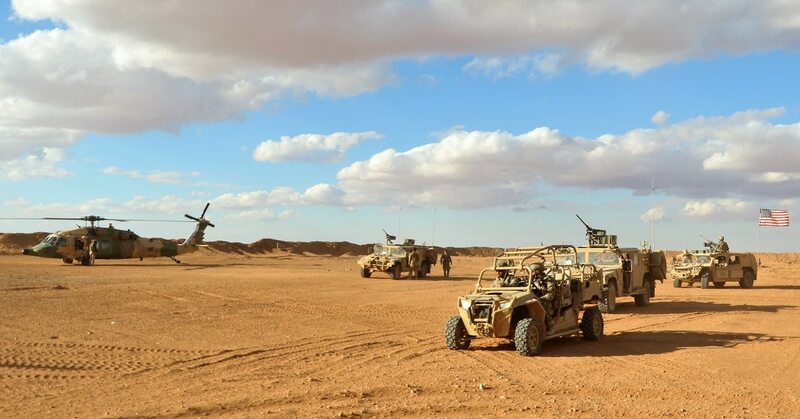 The Marine Corps recently conducted a “show of force” mission near Al Tanf as a reaction to a potential Russian military operation in the region. For years, Syria has festered with rival militias and foreign fighters, including Iranian-backed militias and Russian military forces, both supporting Syria’s embattled regime led by President Bashar Al Assad, as well as Kurdish forces and Turkish-backed groups vying for control over Syria’s north. But some experts suggest that the very presence of Americans may be what ultimately stalls ISIS’ demise. Pentagon leaders warn that it’s still possible for the extremist group to re-emerge, and so a continued U.S. presence in Syria has been long justified. But many experts disagree with that logic. ISIS thrives in chaos. Initially, the extremist group was able to grow and seize territory because of the chaotic Syrian civil war and sectarian tensions that festered in Shiite-dominated Iraq. Allowing low-grade warfare to continue in Syria is likely to benefit the group by providing the stateless, lawless, war-stricken environment where insurgencies flourish. “The argument that ISIS is going to come back if America leaves Syria seems spurious to me,” Joshua Landis, director of the Center for Middle East Studies at the University of Oklahoma, said. “ISIS has never spread in a country where there’s a strong state,” Landis said. Now, ISIS has already shifted back to a grass-roots insurgency, similar to the group’s previous iteration that was known as al-Qaida in Iraq. The original insurgency led by al-Qaida in Iraq grew in the aftermath of the 2003 U.S. invasion and the U.S. attempt to supplant Saddam Hussein’s largely Sunni government with Shiites, sparking intense sectarian violence. The eight-year U.S. military mission there that ended in 2011 helped to quell that insurgency. But it boiled over again in 2014, in part because Assad’s regime was roiled by a civil war and had largely abandoned eastern Syria, allowing ISIS the space to set up a capital for its caliphate. Both the Iraqi and Syrian regimes have strengthened in recent years. Landis said the most effective strategy for the complete elimination of ISIS is to foster peace, stability, a strong state and economic reconstruction. “What America is doing today, which is dividing Syria without spending significant money to rebuild, is going to open the doors for al-Qaida or ISIS to come back,” Landis said. “We’re just keeping this hollowed-out region, hollowed out,” he said. Despite the recent comments from the White House about leaving troops in Syria to contain Iranian influence, the Pentagon has not yet articulated any military mission with that aim. “Right now our troops inside Syria are there for one purpose, and that’s under the U.N. authorization about defeating ISIS,” Mattis said Monday. Mattis said the U.S. presence in Syria is based on United Nations-led peace talks for Syria rather than Iran’s activities. “It’s the Geneva process and the Geneva process has got to come to a conclusion if we are to see this end,” Mattis said. Nevertheless, Mattis acknowledged concerns about Iran and its malevolent influence. Mattis has voiced concerned about Iran for years, dating back to his time as the commander of U.S. Central Command under former president Obama. “As part of this overarching problem, we have to address Iran,” Mattis said. The U.S. exercises influence in Syria from the Kurdish areas in the country’s northeast. The U.S.-backed SDF controls much of that region, while Turkish-backed rebels control select portions of the north. And whatever dream that previously existed of an independent Kurdish state in northern Iraq has largely died. U.S. leaders have shown little willingness to offend their NATO ally Turkey in favor of such a move, as exemplified in the Manbij region stand-off. Keeping portions of northern Syria under Turkish control, though, would satisfy some of the United States’ geopolitical ambitions: It weakens Assad and keeps Syria poor. 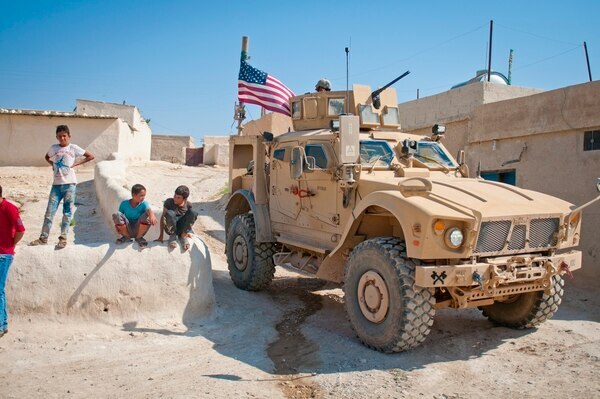 “By denying them northern Syria, you’re keeping them weak,” Landis added. And therein lies a fundamental problem. The Syrian state is only going to heal if it reunites, because if there are provinces not under his control, Assad will wage war. And without a strong, united Syria, ISIS will have room to grow again. The end of counter-ISIS operations? The final phase of U.S.-backed military operations against ISIS will likely wrap up later this year. The Syrian Democratic Forces — backed by U.S.-led airpower and artillery — are in the final phase of a push to eliminate remnants of ISIS in eastern Syria. The airstrike campaign against ISIS is tapering off. 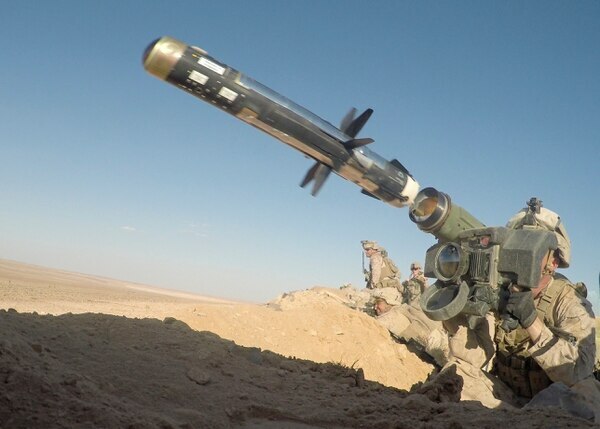 By July 2018, the latest data available, the Inherent Resolve mission has conducted a little more than 3,000 weapon releases for the year. That’s compared to nearly 28,000 for the same time period through July 2017, roughly 17,000 through July 2016, and almost 14,000 through July 2015. The group’s ability to direct attacks on Western countries appears to be waning. An annual U.S. State Department survey of global terrorism noted a 23 percent drop in terrorist attacks in 2017 as compared to the previous year. That’s the third year of declining attacks. The report notes that much of the decrease is due to successes against ISIS in Iraq and Syria. It’s unclear whether the ISIS affiliates beyond Iraq and Syria, in places like Afghanistan, Libya and elsewhere, pose a significant threat beyond their local region or to the U.S. homeland. “There are remnants of ISIS in Iraq and Syria that are capable of launching local terrorist attacks, but I think many of the attacks in Western countries are conducted by ISIS wannabes,” Phillips said. Thomas Mockaitis, a professor at DePaul University and consultant for the Center for Civil-Military Relations at the Naval Postgraduate School, was blunt in his assessment. “Terrorism is a persistent nuisance, a problem, but not an existential threat,” Mockaitis said. Though he sees a need to maintain pressure on ISIS, he is critical of the over-militarized response to ISIS, arguing that a balance of approaches is what it will take to truly defeat the group’s ideology, which is what it exports when other groups attach themselves to its message. A government official with knowledge of the work of the Global Coalition to Defeat ISIS but who was not authorized to speak to the media told Military Times that the counter-ISIS mission is “evolving” but still necessary. The official acknowledged that the threat from ISIS affiliates outside its core in Iraq and Syria does not necessarily reflect that the group has a real global reach or influence. Several pre-existing groups, such as former factions of al-Shabbab in East Africa and Abu Sayyaf in the Philippines, have taken exactly that tactic of attaching themselves to the ISIS brand. Despite professed allegiances, the numbers just are not there. Across the entire continent of Africa there are an estimated 6,000 ISIS-affiliated fighters, according to data from the Combating Terrorism Center at West Point. And after a U.S.-Filipino assault in Marawi last year, current reports put the number of remaining ISIS fighters at about 200, according to the Pentagon. Yet despite the exponential decline in enemy fighters, U.S. investment is increasing. 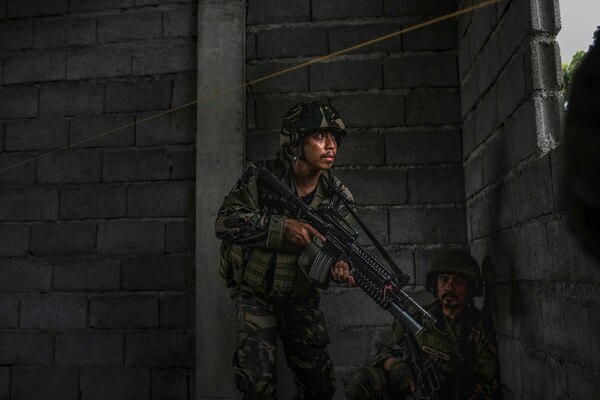 Last year’s total budget for the Philippine operation was $32.4 million. Next year’s budget seeks $108.2 million, a third of which is devoted to intelligence, surveillance and reconnaissance. That includes plans for five military facilities dotting the islands. The larger strategy builds a partnership with the Pacific Ocean nation that could help counter China. Experts said it’s questionable whether ISIS-type territorial gains could emerge in areas such as northern Africa or Yemen. But ISIS has created a powerful brand, one that was boosted by its battlefield victories in Iraq in 2014. That global brand was attractive to struggling groups elsewhere, such as Afghanistan’s ISIS offshoot — dubbed Khorasan province, or ISIS-K.
“Although the ideological links between the Afghan-based group and the main group in Iraq and Syria are strong, the organizational and operational links I think are very attenuated [weak],” Phillips said. That sentiment was echoed by Bill Roggio, a senior fellow at the Foundation for the Defense of Democracies and editor of the Long War Journal. Roggio said that ISIS-K’s presence in Afghanistan is at least partially made up of disaffected Taliban. And while the group swore allegiance to the Islamic State’s leader, Abu Bakr al-Baghdadi, and is certainly an official ISIS province, it has yet to be seen that the disconnected groups share much other than propaganda. ISIS-K’s presence in eastern Afghanistan’s Nangarhar province, for instance, was large and it continues despite the large amount of resources the U.S. military allocated to uproot them from there, according to Roggio. 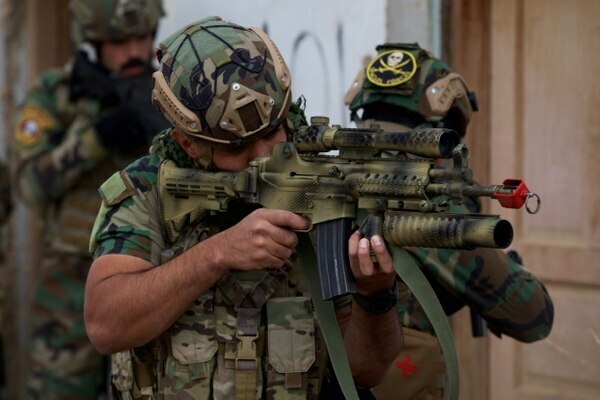 Several Army Green Berets have died in anti-ISIS-K operations in Nangarhar this year. ISIS-K tends to magnify its presence by conducting particularly brutal suicide attacks against local civilians. The Taliban also conduct suicide attacks, but most of these incidents are targeted against foreigners and government offices, Roggio said. ISIS-K’s strikes, meanwhile, tend to be of a more brutal variety, like hitting non-profit offices focused on caring for children. That brutality turns away some even within the Taliban. But were a peace settlement between the Afghan government and Taliban to occur, Roggio hypothesized that ISIS-K could be a landing spot for hardliners in the insurgent group who oppose such a move. Roggio doesn’t see a peace settlement happening soon, and if it did, the Taliban would still have the network to fight ISIS-K. This was evident when the Taliban routed another ISIS stronghold in the northern Afghan province of Jowzjan. More than 200 ISIS fighters surrendered to the Afghan government, a decisive victory for the Taliban. 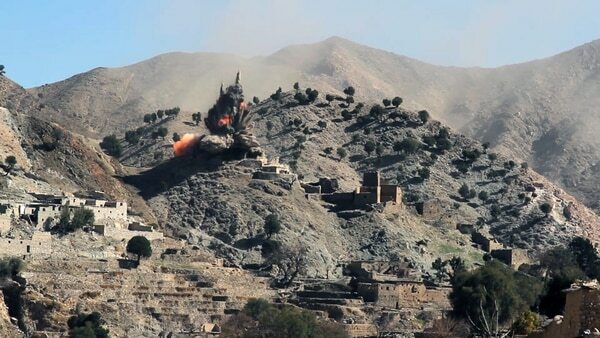 The Taliban have remained a cohesive fighting force for the past 17 years. Compared to the Taliban, ISIS is small, limited in its range, and mostly appeals to the more violent and simplistic jihadists. And it’s still unclear whether ISIS affiliates in Afghanistan, or elsewhere, actually pose a threat to the U.S. homeland. But if U.S. officials decide that they do, the prescription to the ailment will have to be more than using the military as a placeholder. Anthony Cordesman, a national security analyst for the Center for Strategic and International Studies, is cautious about what plan, if any, the U.S. government has for these regions if the U.S. does decide ISIS is an existential threat. He echoed Landis' sentiments regarding the lack of planning and funding for reconstruction that could result in ISIS elements maintaining local control for long periods through targeted terrorist attacks on the local population. “And the problem you also have is we have yet to show we have any strategy that we have to create a reconstructed, redeveloped Iraq that meets needs over time,” he said.